Alcochem BlueBoards come with an unique design that can be regonized by the glueboardscanner from Alcochem. These Blueboards are the ideal compromise between the required colour contrast we need to visualise the insects and the aesthetics that clients demand from these boards. As the blue colour of the boards match up with the blue light emitted by the UV-A lamps, the Blueboard blends completely into the background. The adhesives used for the boards are glues with very special characteristics designed to grab and then hold very light but often strong insects over an extended period of time under very demanding conditions. Insects are extremely light and create little or no pressure on the areas were they land. If the designated landing area is a glue board, than we still want these insects retained on the board with no change of escaping. In addition to this demand we want the boards to be handled easy and at a wide variety of temperatures. From close to 0 degrees Celsius up to 65 degrees Celsius, the glue boards will have to perform its function: keep the insects on the board. 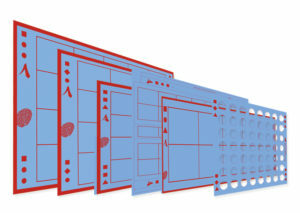 With this intelligent software program we can easily and accurately scan glue boards in an automated process. This is done by making a photo from the glue board with our special developed application. (app). The results it provides are 90-95% accurate. These Apps are freely available at the App store from Apple and from Google play. All you need to do is register once. To meet the international food standards, it’s important that the counting of flies is done as accurate – and constant – as possible. This will allow for a good analysis and follow up steps. This will allow for a good analysis and follow up steps. Excluding the human factor in this process, makes the results both more constant and more accurate.